"There is a stage in a child's life when it cannot separate the religious from the merely festal aspect of Christmas or Easter. I have been told of a very small and very devout boy who was heard murmuring to himself on Easter morning a poem of his own composition which began ‘Chocolate eggs and Jesus risen.’ This seems to me, for his age, both admirable poetry and admirable piety. But of course the time will soon come when such a child can no longer effortlessly and spontaneously enjoy that unity. He will become able to distinguish the spiritual from the ritual and festal aspect of Easter; chocolate eggs will no longer seem sacramental. And once he has distinguished he must put one or the other first. If he puts the spiritual first he can still taste something of Easter in the chocolate eggs; if he puts the eggs first they will soon be no more than any other sweetmeat. They will have taken on an independent, and therefore a soon withering, life." C.S Lewis "Reflections on the Psalms." This quote is apparently the most controversial and obscure thing I have ever reproduced. Lewis has written extensively on, e.g how the traditions of Christmas are widely practised among non religious people; and how the tradition of church going survives among non Christian people. The context of the quote is a discussion of "praise" in the book of Psalms. Having talked about death and curses in the psalms, I'm now going to talk about joy and beauty in the Psalms. King David danced before the Ark of the Covenant: his wife didn't approve. Most Anglicans would have been on the side of the Queen. Our worship is quiet, respectful, even clinical. The Jews, in that sense, were more like pagans. This "joy" was focussed on the temple. By the way, don't make the mistake of thinking that the Temple was to the Synagogue as the Cathedral is to the Parish Church. The Temple was the place for sacrifice. The Synagogue was a meeting place for prayer and study. It would be strange to us that the Jewish temple, like the Parthenon, was a holy abattoir, but bare in mind that it was also a holy barbecue, smelling of cooked meat. The Jews didn't "do" philosophy in the way the Greeks did. If you'd ask David to distinguish between "enjoying" God in a spiritual sense and enjoying the festivities of the temple, he wouldn't have understood the question. Think of a modern Christian farm labourer enjoying harvest festival: he's really thanking God for a good harvest; he's really pleased that the work is over; he's really looking forward to harvest supper, and he's really enjoying the old hymns. To ask him "how much of your enjoyment is in praising God, and how much is in singing an old song that your dad and grandad sung?" would be meaningless to him. c.f The little boy with his easter egg. If a modern Christian could, in fact, have seen the ancient Jewish worship, he or she would see the dancers, the musicians, the priests, etc, and might in addition have "felt" the presence of God. The modern Christian would be aware of that duality. The ancient Jew would not. Once you can make the distinction between the "rite" and the "vision of god" then there is a danger that the rite becomes a substitute for a rival to God. This did, in fact, happen in later Judaism, and it is what the prophets complain about. However, we already know the ways in which ritual and sacrifice can be abused. and don't need to dwell on it. The good thing about the praising Psalms is that they remind us that this need not be so: that there is a time or a state of mind when the Temple was the "living heart of Judaism" which the singer longed for. This joy is less like "love for God" than it is like "appetite for God": the singer wants to live in the temple and sing songs to God, but he doesn't think that these are pious or merit-worthy feelings. It wouldn't be a good idea to try to bring this kind of exuberance back into the church of England. Firstly, we're British and bad at it. More importantly, the concept of the Atonement was not present in Judaism: there's a "tragic" element to Christianity. You can't dance before the ark so unaffectedly once you know what your salvation cost. In the following chapter, I will continue the theme of joy and talk about why the Psalmist feel that the Torah is "sweeter than honey." Can I go, now? Please? There's some TV series people keep asking me about. If mere ritual feasts are "soon withering" then why do they persist while the religions come and go? The religions may come and go, but the desire for spirituality remains. The ritual feasts are an acknowledgment of that desire, however unconsciously so. And as for the "withering", it's more in the context of the life of the child, and then the man, than the ritual feast itself in the context of its culture and religion. Quite. Mr Lewis is saying, fairly clearly I thought, "If you believe in Easter, then Easter Eggs remain special: if you don't believe in Easter, then they're just sweets" and drawing an analogy with religious ceremony in general. But doesn't the fact that many more people celebrate Easter (and Christmas, and St. Valentine's Day, and so on) as a secular festival than a religious one suggest that Lewis has things exactly the wrong way round, and that the chocolate eggs regularly persist when people stop thinking about Jesus? Even if you argue (as I don't) that the festival is a response to a spritual need and not just a desire to celebrate then it says something about relative priorities. So all the people who buy cadbury's cream eggs each spring are experiencing the same magical feelings as the little boy who, as Lewis put it, tasted the resurrection in the chocolate? Or what the little boy associated with the resurrection was really just the taste of sugar? Or what? Well... As I read it, Lewis thinks that without the sacred element the boy will lose interest in the eggs or simply eat them all the year round. In other words, that the ritual feast, being worldly, only endures because it connects us with the eternal sacred. But in fact we see that even atheists celebrate ritual feasts, and that rituals regularly persist long after the things they symbolised are forgotten. So it seems to me that it's the ritual feasts that persist and the sacred meanings people attach to them that wither away. You might say that's because of original sin; I might say it's because people have similar social needs... but either way, I think Lewis is wrong. 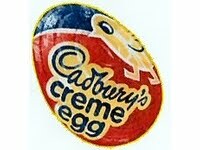 I do know non-religious people who look forward to Easter season because they will, then, be able to get the only-available-around-Easter Cadbury Creme Eggs. They're not getting anything spiritual out of it, though, unless they've all been holding back on me about their feelings on the Eggs. Now, if we want to take Lewis's position on spirituality vs. mere ritual feast outside the realm of Christianity, I can tell you what I've heard from a lot of people about Burning Man, and the Temple Burn the night after the Big Burn, and The Effigy Of The Event for smaller Regional Burns, and how this compares to just doing things with fire on non-Burn days. You can burn wood for heat, you can burn propane for heat, you can burn wood and other non-hazardous materials for disposal purposes, but it does not have the same emotional impact on a hard-core Burner that an actual Burn does. And while a non-burning destruction of an effigy does not have the same impact as a wonderful huge fire, the important thing is that a group of people have come together to ritually destroy something, and some of them derive spiritual enjoyment from it. I absolutely agree that one of the things that rituals can do is let people feel a connection with the sacred - whatever the sacred is - but I read Lewis as saying that it's the sacrament that preserves the ritual, which contradicts what I observe of the way people use rituals. And I (mildly) object to that, because I think Lewis is trying to persuade us that it's the thought of Jesus Risen that makes us want to give each other chocolate eggs. Not quite sure that I know what a burning man is, but you are quite welcome to post about it in this forum if you wish. Thanks for interesting comments. Thanks for the summary, Andrew - and thanks for taking the time to try and explain this. But now I'm feeling dense because I don't see how this addresses my question. Easter eggs are not, in fact, "just sweets" to people who don't believe in Easter and a birthday cake is not "just a cake" even though there's no sacred aspect to a birthday party. So what is it that soon withers when the festal is seperated from the sacred? I think Julia might say that it's the desire for the sacred that keeps the ritual alive; so no ritual is ever fully seperated from its sacred roots. I'm skeptical about that but not unsympathetic - I think it probably depends on where you draw the line between a ritual, a ceremony, and a superstition. Okay - I can make sense of that, particularly with the context. Without it, the best alternate reading I could come up with was that people who put chocolate eggs before the resurrection end up losing the resurrection in favour of the eggs; which seemed a bit of a tautology. I did a bit of reading on the Jewish sacrificial tradition, BTW, and it does seem to have been interestingly different from the Graeco-Roman. More like inviting God to share a ritual meal than giving Him a present. But you may have known that already, what with it being all biblical and stuff?